Most of the internet users prefer using Google talk as default chat client. Changing its appearance can enhance you chatting experience and it can be done using Gtalk themes. If you are bored with default look, mix some colors and change chatting styles and chat windows interface with cool,funny and fantastic Google Talk themes. We have already told How to Show Current Music Track on Gtalk in WMP 12, Windows 7. Now you can change appearance of Gtalk according to your choice and for that You can find a huge collection of Google talk Themes here for free download. How to install Google Talk theme? Download a theme from the website. If there is an executable between the files you extracted, run it. This will install the theme for you. You’re done. If you can’t find an executable, you need to install the theme manually. For Windows XP – This is C:\Documents and Settings\USERNAME\Local Settings\Application Data\Google\Google Talk\themes\user\chat. After following above steps, You need to apply Google talk theme. How to change Google Talk Theme? Start Google Talk if it’s not already running. Now open your settings window by clicking ‘Settings’. Your theme should appear in the list, if not, you did something wrong. Q: What is out? 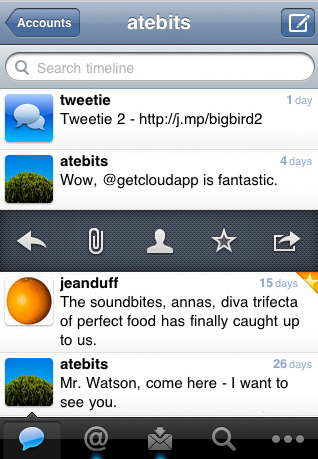 A: The Twitter Client Tweetie 2 (USD$3) has been updated and as of now available in the App Store. 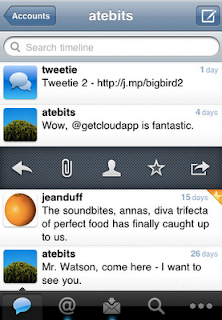 The update is free for Tweetie 2 owners, but not for the original Tweetie owners. The latter group has to purchase Tweetie 2 for USD$3. -- Looking for an scratch proof iPhone 3G case? Go get an invisibleSHIELD for the iPhone, the strongest protection for your iPhone backed by a 30 day moneyback guarantee, lifetime replacement warranty, and FREE shipping! **Scratch Proof Your New iPod Touch, Get The invisibleSHIELD. Free Shipping. Lifetime Replacement Guarantee. -- Looking for hosting? Go get $10 Off "MooPon" for The Original FatCow-- LegenDairy Hosting! I just tried Google Labs FastFlip feature on my iPhone. With this feature, you can search for websites based on google keywords. The search result is showing immediately the the front page of the first hit. Meanwhile, 29 other front pages are waiting to be shown. To see the next one just swipe from right to left on your multitouch screen. It will shows up immediately. One tap and it shows actions to Zoom, Close or just go to the site. I think the trick is that google will take 30 screenshots (bitmaps) of the 30 front pages, queues them for you. Just try it your self via fastflip.googlelabs.com. Q: What is up? A: Company Stuart Hughes, specialized in pimping-up gadgets, just unveils the most expensive phone in the world. It is the iPhone 3GS SUPREME costing GBP 1.92 Million. (USD$3,150,000). Q: What did they do with the iPhone GS? A: They gave it a gold case plus a nice diamond bezel, and a golden Apple logo on the back. Q: Who designed it and how long did it take to create it? A: Designed by Stuart Hughes of Liverpool , England. But the hard part was a 10 months of making it. 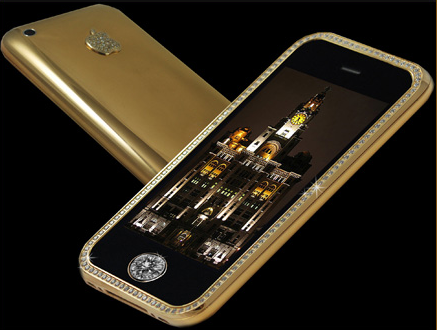 That includes , a 271 grams iPhone case of 22 carat gold. The front bezel contains 136 flawless diamonds (color F and not less than 68 cts) . The Apple logo in the back is in solid gold, has 53 flawless diamonds. The Home button is made of a single cut very rare diamond at 7.1 carats Q: Who bought it? A: The extraordinary handset was commissioned by an anonymous Australian businessman from the Gold mining industry. Become a MakeUseOf fan on Facebook? – Our photos, MakeUseOf specials and more. Check out the top picks from MakeUseOf Geeky Fun during the last week. If you would like to keep up with all latest Geeky Fun additions, please subscribe to the Geeky Fun feed here. You can also subscribe and get the latest additions via email. Modding and building customized gadgets isn't really a new hobby. People have been doing it since electricity first became widely available. It's pretty much how everything electronic got to be where it's at – people working in their basements and forgetting to shower for weeks on end. But with the sheer availability of tech mod guides now on the internet, the hobby really has changed forever. 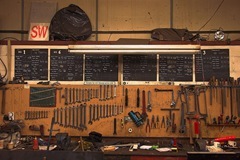 Pretty much anybody can go out to their tool shed, spend a few hours hammering and sawing away with the end result being a terrific creation that'll make life just that little bit easier. While Googling pretty much any object followed by the word 'hack' or 'mod' will yield results showing you how to mutilate them into some powerful little device – I thought I'd share with you three great sites packed full of guides and how-to articles which show you how to perform tech mods on just about anything from iPhones to routers to staplers. Yes, staplers. This website is entirely user generated and it's quite possibly the largest directory of hacks and tech mods out there. People submit guides to show you how to build these incredible gadgets. For example, on the homepage at the time of writing this article, I’ve seen guides showing you how to make a 'Laser Monocle Headpiece' and an 'Electromagnetic Actuator'. All of the guides listed on this site can be built on a workbench at home. There is rarely a need for specialist tools or materials and when there is the author of the guide tells you where you can get them cheaply online. 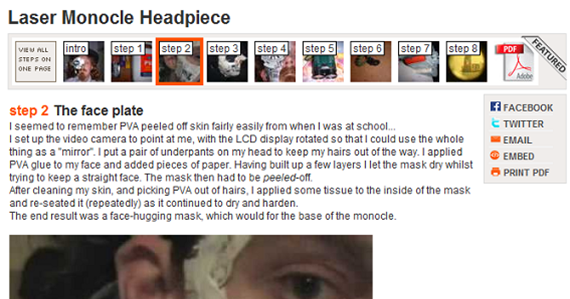 Each guide is broken up into several parts as you can see from the screenshot above. Also, any files such as schematics, templates and detailed layouts are uploaded alongside the guide and can easily be downloaded (mostly as PDF format). While you do have to register to submit guides – you can read and download guides without registering for free. Hack a Day is a small blog set up to profile hacks from around the web and also to feature their own large guides once per week. Some of the guides range from the utterly simple yet useful such as making gloves that work with touch screen phones. In their weekly how-to section, there are some detailed "how-tos" which could actually come in very useful such as building your very own spot welder. All the guides have good instructional images and clear step-by-step points along with tools and parts guides. This site has been running for quite some time now and is updated daily. There are well in excess of 1,000 great hacks and guides listed here. This website is basically a combination of the best hacks from all over the internet. During my research for this article, I came across some God-awful sites with maybe one or two good guides on them. So instead of wading through tonnes of horrible (and even some very questionable or incorrect) guides, visit HacknMod to find the top guides that they plucked out from the sea of rubbish. Below is a section of the homepage and as you can see the offer a variety of hacks – not all of which are restricted to the tech savvy. For example, they have an abundance of articles on kite photography, LED display tutorials and games consoles mods. There are also some practical guides for problems many of us run into such as extending the reach of your WiFi signal and home entertainment mods. HacknMod also run their own store which is perfect for cheap parts and cosmetic features. 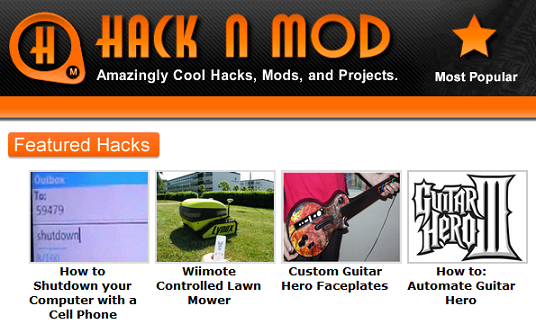 The three sites above combine the best guides, hacks and tech mods on the internet for you. Pretty much any problem tech related or not can be solved with a few hours of tinkering in your garden shed. Have you been known to create your own little gizmos? If so what have you created? Please share with other MakeUseOf readers in the comments! Regular users of Opera would vouch that the Notes feature is a very useful tool to have. A simple text capturing utility like that is handy for impromptu notes and saving scraps of text before shifting it to a more permanent location. If you are an avid downloader like me, saving multiple download links is one offhand use. If you are a serious internet researcher and fancy something simple for quick notes, then you can gravitate between the feature rich Zotero or something much simpler. QuickFox Notes, an add-on for Firefox is that simpler alternative to take notes in Firefox. QuickFox Notes also integrates with Firefox Bookmarks as it uses the bookmarks folder to archive the notes. A QuickFox Notes folder gets added to your bookmark folders that stores all your notes. 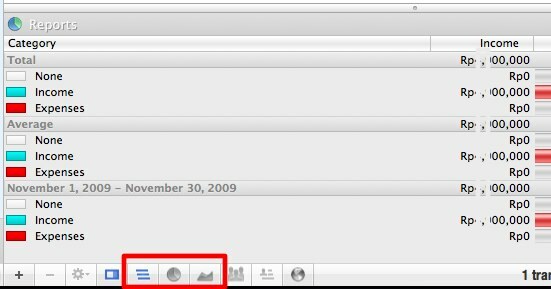 As a part of bookmarks, all notes can thus be easily synchronized across multiple computers if one uses a bookmark synchronization utility like Xmarks or Mozilla Weave. The Firefox adds on just 41KB with its install. To use QuickFox Notes the first time, right-click anywhere on the Firefox toolbar and drag the QuickFox Notes icon from the Customize Toolbar window to anywhere on the browser tool strip. Though there is no save a text snippet with a right click, copy-paste to QuickFox Notes by clicking the icon is fast enough. Left-click on the icon to open QuickFox in a separate window OR middle-click on the icon to open it in a browser tab. The shortcut is CTRL+SHIFT+F. QuickFox Notes is similar to something like Notepad++ with its multiple tabbed look. QuickFox may be tiny but it gives you some features that hopefully makes the ability to take notes in Firefox something more than a humdrum activity. Some customizable settings can be found under Options. Quite a few options in the background color menu. I went with a sober PaleGoldenRod. 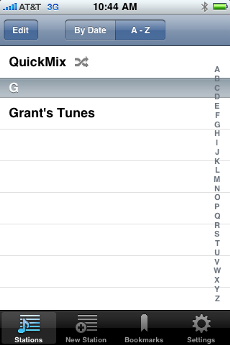 It's enabled by default and any note you create gets saved automatically in the bookmarks folder. The actual content of the note is stored in the description field of the bookmark. This is not enabled by default. Enabling this helps to just select the text in the note and paste it into another program without the whole right-click copy-paste routine. This is especially useful with links that we want to insert back into the browser. Notes can be renamed with a right-click on each note's tab. Notes can be imported from text files and exported individually, or as a bunch to a text file. 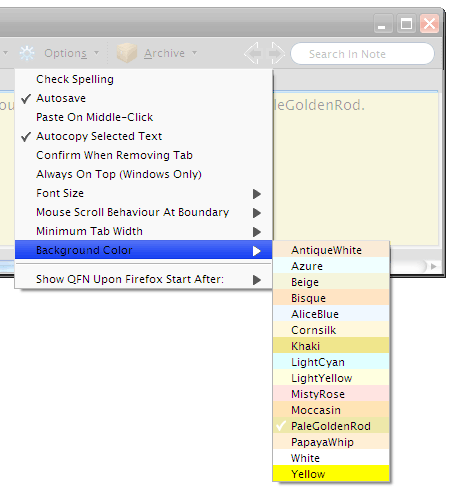 Notes which are not used can be moved to Archive from the QuickFox Notes Archive menu or by double clicking on the tab. Moving unused notes frees up space in the interface. Notes can be synchronized with Xmarks and thus accessed from anywhere (because they are stored as a bookmark folder). As they are stored as a folder, the folder can be copied and backed up elsewhere easily. QuickFox Notes is a very useful add-on for those of us who are very browser-centric in our activities. Our copy-paste jobs can be saved in external Notepad files also, but it's not too much a time saver that way. QuickFox Notes though, is. QuickFox Notes ver.1.2G is compatible with Firefox 3+ and can downloaded from the Mozilla Add-ons page. Do you think that QuickFox Notes is a noteworthy addition to your Firefox add-on collection? Leave a note in our comment section. In this post, we’re going to take an in depth look at the Pandora iPhone and iPod Touch application in a continuing series of iPhone and iPod Touch applications right here on MakeUseOf. Released originally in 2008, Pandora’s free iPhone app features all of the great features of the famous web application, as been seen on MakeUseOf before. If you’re not familiar with Pandora, the website lets you create your own custom radio station by naming a favorite artist or song, and then automatically adds variety to your stations and plays you songs from a vast library. 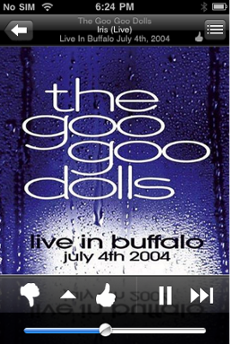 However, with Pandora’s mobile app, this functionality integrates your iPhone and internet radio, anywhere you go! The application carries a similar user interface to Pandora’s online player, complete with album artwork, thumbs up and thumbs down voting buttons, a skip button, play/pause control and volume control (you can listen through a headset/earbuds or just through the device’s speaker). 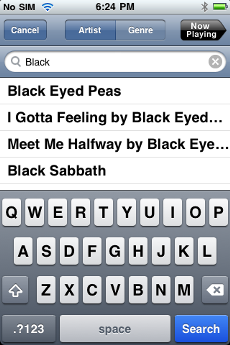 Just like browsing through songs, you can also look at your favorite “bookmarked” songs from your account on the app. New stations can be created through the website and will show up on the application, and “Quickmix” stations can also be created directly from the device for playback at both locations. Settings such as the account you’re signed into, power management/battery preservation and higher quality audio are also available. The feature of viewing why a song was actually played also is on the app. So you can see something similar to “We’re playing this track because it features varying tempo and time signatures, repetitive melodic phrasing, etc” right on your device, which is a handy feature to find out why the system might have picked that song for your musical taste. Currently playing songs can also be bought off of the iTunes store on your device with the click of a button, and they can also be skipped up to six times per hour, per station if you don’t like the song selection. In a few personal tests with medium signal quality on AT&T’s 3G network near Los Angeles, I found the app to have great audio quality, although there were a few times when I would skip a song or the song would change and I would see a ten or fifteen second delay. In full signal though, this delay was not present, and there was a smooth transition between songs. Use of the app though on my home wifi network though showed great audio quality as well as no delays in between songs, although when I took my iPhone out for a day of 3G music streaming, battery life on my device took a big hit. Pandora’s iPhone/iPod Touch app [iTunes link] is a must-have application for music lovers, and has a great array of features to accompany mobile device support with the one-click iTunes purchasing ability, ability to skip songs, and the synchronization of stations with the website player. 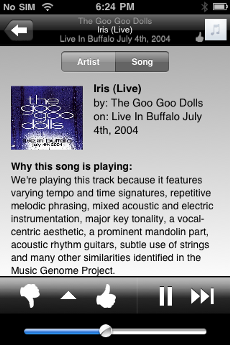 Do you use the Pandora iPhone/iPod Touch app or the website to listen to music? What other “must have” iPhone applications do you have? Share your thoughts in the comments below! Open your palm but don’t spread the fingers. Elders in my country say that if there are gaping holes between your fingers, you must be bad in managing your money. Their “logical” explanation goes like this: no matter how much money you have in your hand, because there are holes, everything will slip away easily. Call me superstitious, but I believe them. I happen to be a “holes in hands” kind of person. My monthly income today is several times over my first salary, but at the end of every month, I’m in the same position as I’ve always been: zero amount in my bank account with no idea where the money went. With several mouths to feed, I realize that I can’t go on like this forever. I have to take action to improve my financial life. Improving is not only about increasing the income, but also about stopping the bleeding – by cutting the unnecessary spending. To be able to do that, I have to know the details of the ins and outs. I desperately need software to manage finances. I consider finding iCompta around the same time as reading Dean’s article as a nudge to start managing my money more seriously. I’ve come across Buddi before (mentioned here, here and here), but never succeeded in persuading me to take the first step. After playing around with iCompta a little bit and seeing what it can do, I think I’ll settle with this particular software to manage finances. Accounts: is the place to list down all your accounts such as bank accounts, Paypal, and credit cards; and all the money that comes in and out. You can set different currencies and assign different persons for each account. Budgets: is the place to list down your expense and income. You can put household, personal and/or company budget here. People: is the place to list down the people with the account. They could be family members, office partners, or just yourself. You can add new accounts, budgets, and people clicking on the ‘Add’ button at the bottom left of the window. The app automatically put my country’s currency as the default. And every time I added a new one, iCompta would connect to the web and automatically calculate the exchange rate using the default currency as the base. There’s also an option to add categories here. 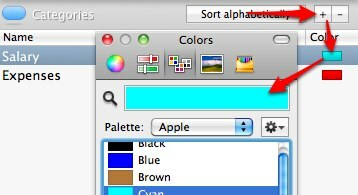 Just click on the plus button (+), define the category, and choose a color for it. You’d want to add as many detailed categories as possible because they will come in handy later. The next step I took was creating accounts. 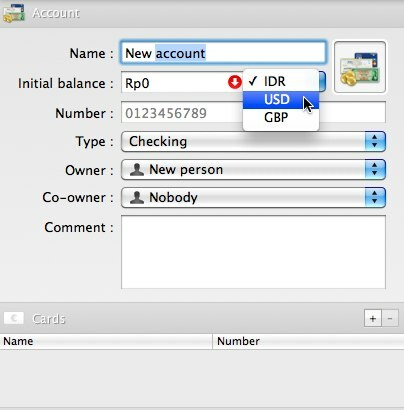 Aside from assigning name, there are also options to set the currency, account type, owner and co-owner of the account. If you have cards (credit and debit) related to the account, you could add them here. Finished with the accounts, I moved on to People. 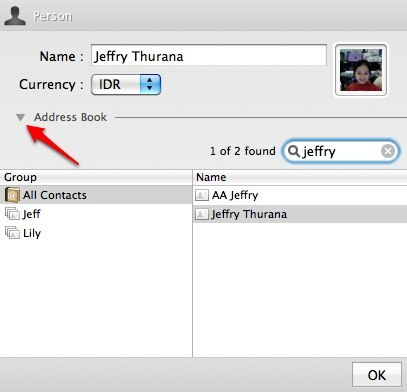 iCompta integrates well with Mac’s address book so you could get the names from it. Don’t forget to set the currency for each person. Then there are the budgets. They are the tools to track the money flow on a periodical basis. For each budget item, you could add related accounts and categories with their amount. The amount could be positive (credit) or negative (debit). 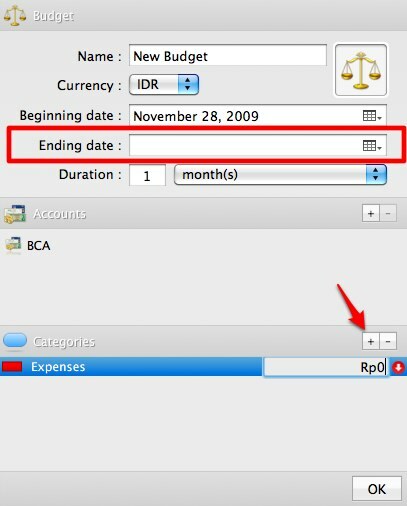 To set a repeating budget, leave the ending date empty. Basically, that’s about everything that you have to do to start managing your money with iCompta. But the hardest part is yet to come. iCompta comes with tools to help you with the general monitoring and overall progress. There are reports, statistic pie chart, and balance evolution graph. All these are accessible from the bottom bar of the window. Since I’ve just started, I don’t have anything to show yet. We’ll see what happens after a month. With the help of iCompta, I think I’ll be able make a difference. One thing is missing, though; iCal integration. 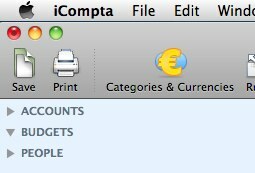 It would be nice if iCompta could add regular expenses to iCal and create reminder few days before they are due. Do you manage your financial life? Have you tried iCompta? Do you know other free alternatives? Share using the comment below. Goals often remain just that. Goals. That’s why so many New Year resolutions never come to life. Procrastination, both a bliss and a curse. Developing new habits and routines and managing away bad habits is often even harder. It’s not a one-time or abstract goal. 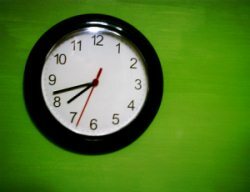 The clock goes round and round; and every day, you will need to go over the checklist. Of course the real goal would be not needing that checklist but rather to develop habit that’s instinctive and becomes part of the everyday routine. You won’t notice the act, but benefit from the results. It is said that it takes 21 consequent days to develop a habit. In other words; if you manage to hold out that long, you’ve practically made it. 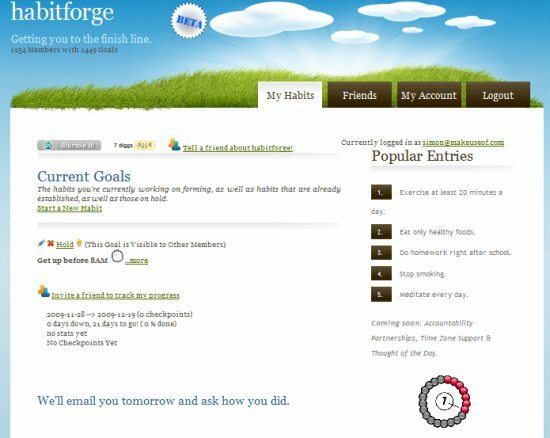 Habitforge puts that rule to use, and helps you to make new habits or with managing away bad habits. It’s a site everyone can use to make that little tweak to their daily routine. The concept is very simple; report of your daily successes and failures until you manage to cross that 21 day mark. All you need is an internet browser and email address. On the site, start out by logging in or signing up for a free account. Doing the latter, you’ll need to provide an email and password as well as time zone information – both for later access and the creation of the goal. The registration is entirely free and you won’t be bothered with email confirmation. Starting a new goal is even easier. Specify a title and category then hit the button. Categories will allow other users to track people’s goals and can also serve as a source of information. Leave the checkbox unchecked if you want your goal to be a private one, but know that this eliminates a crucial part of Habitsource: your supporters. You can create positive goals, like rising early every day, or negative ones – Habitforge is extremely popular with people trying to quit smoking. And better yet, you can create as many goals as you want! 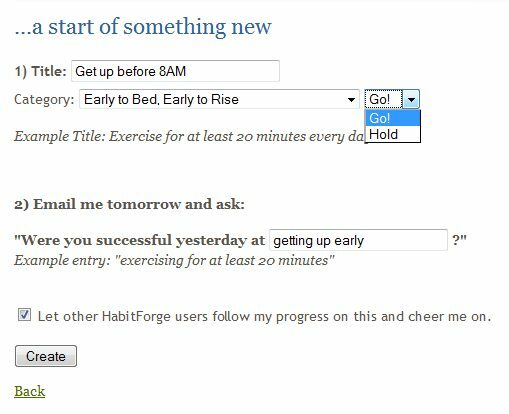 Each day, you’ll receive an email from Habitforge, checking up on your previous day. It’s recommended to serve each email with an answer as soon as possible, but not necessary. Back on the site, your goal’s progress will be tracked. As I’ve said before, you’ll want to get that counter to reach 21. By failing a day, or forgetting to answer a mail altogether, the counter will be reset. You can make up excuses in the comments, but it won’t help much with your goal. Personally, I’m not doing very well, as you can see in the screenshot. If you chose to make your goal public, you can invite people to cheer for you. They’ll first need to sign up for a free account, though. Knowing that some people have your back and – more importantly – the extra pressure of them keeping a close eye on you are good motivators! Do you have a goal in mind yet? Tell us about it in the comments section below – perhaps you’ll inspire one of our other readers! Craigslist.org is an online wanted ads site that’s been around for a bit. It’s a great tool if you are looking to buy something second hand. As mentioned in other MakeUseOf articles, its design leaves something to be desired but there is no doubt to its usefulness. There are some irritations such as the absence of pictures in the Craigslist search results (check out David Pierce’s list of 5 Tools To Make Craigslist Even More Useful for “ByeByeList”) and they could do a bit better with local search options like having the ability to set a search radius (check out Craiglook). I also noticed that Craigslist does not offer the ability (out-of-the-box at least) to have a search results notification sent to your email inbox. Do you ever get tired of constantly running the same search over and over, hoping the item you’re looking for will show up? Well, since Craigslist search makes use of RSS feeds (Track A Craigslist Category In a Feed Reader), searching for the same item multiple times is a complete waste of time. Let me show you how to take a search term, find the RSS feed for that search term, and have the feed updates emailed to you! Let’s start with Craigslist, the search, and the feed. First find your local Craigslist page. 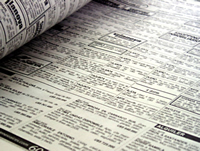 Head to Craigslist.org, and look to the lists off to the right to find your local country, state or city (or nearest). Once you find the closest location you can find, search for what you are looking for. Just type something in the search box. NOTE: you may find better, more narrowed search results by navigating to a category and then running the search, but it’s all up to you. One thing that Craigslist does do right is it adds RSS feeds… everywhere! For instance, they have feeds set up for categories, subcategories and even search terms! In each case, just check out the bottom right corner of the page for the RSS icon. Now all there is to do is have the FEED updates emailed to you. There is a tool called FeedMyInbox (for more information on the tool, check out MakeUseOf’s overview). Basically this site offers you the ability to enter a feed and your email address, and have the updates sent directly to your inbox. You can do this without even signing up for an account! Please note that email updates will only be sent once every 24 hours with all updates from that time frame. So, head back to Craigslist to copy the feed for your Craigslist search. The easiest way to do this is to right-click on the RSS icon and click COPY (or COPY LINK LOCATION – may depend on your browser of choice). Now head over to FeedMyInbox and paste the feed address into the website URL field. 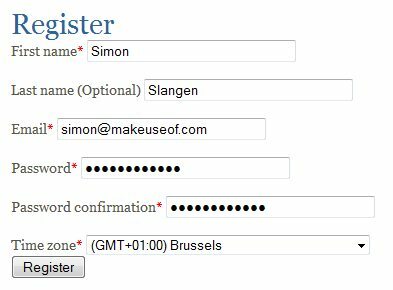 Then, obviously, enter your email address into the email address field. Next, you will have a verification email sent to you to make sure it was really you who signed up to receive the updates. Just click the confirmation link knowing that you always have the option to cancel the updates anytime you want. And that’s how to save the time of repeating a Craigslist search over and over on Craigslist by have the results sent directly to your email inbox! Did you find this helpful? Do you have another method? We’d love to hear it in the comments.